General Adaption Syndrome is a stress model developed by Dr. Hans Selye, a Hungarian endocrinologist. It is divided into three stages: alarm, where the body reacts to the fight or flight response, resistance, where the body attempts to return to normal, and exhaustion, where tissues in the body become susceptible to dysfunction. 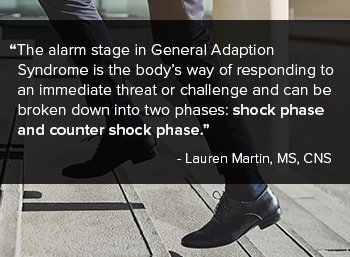 This article focuses on the initial reaction to stress that occurs during the earliest stage - the alarm stage. Dr. Selye believed the General Adaption Syndrome to be the sum of all non-specific, systemic reactions of the body, which ensure upon long continued exposure to stress.1 Dr. Selye found stress different than other physiological responses to the body because it is a result of both eustress (positive stressors such as marriage, moving, changing jobs, and making new friends) and distress (negative stressors such as a result of frustrating, traumatic, and unpleasant situations that induce emotions of fear, anger, and shock.) 2,3 Stressors were categorized as physical or emotional agents that trigger a physiological response to stress. As the body goes through the phases of the alarm stage, defensive mechanisms are activated through the Hypothalamus-Pituitary-Adrenal Axis (HPA Axis) to fight against the stressors. The hypothalamus activates adrenal functions and prepares the body for fight or flight by increasing heart rate and blood flow to the muscles, heart, and brain.3 Common changes associated with the alarm stage include heart palpitations, shallow breathing, muscle tension in lower back and neck, nausea, anxiety, dizziness, sweating, and numbness of the limbs.2 Continued exposure to stressors cause the body to transition from the alarm stage to the resistance stage of the General Adaption Syndrome. Selye H. The general adaptation syndrome and the diseases of adaptation. The Journal of clinical endocrinology & metabolism. 1946;6(2):117-230. Von Onciul J. ABC of work related disorders. Stress at work. BMJ: British Medical Journal. 1996;313(7059):745. Colligan TW, Higgins EM. Workplace stress: Etiology and consequences. Journal of workplace behavioral health. 2006;21(2):89-97.